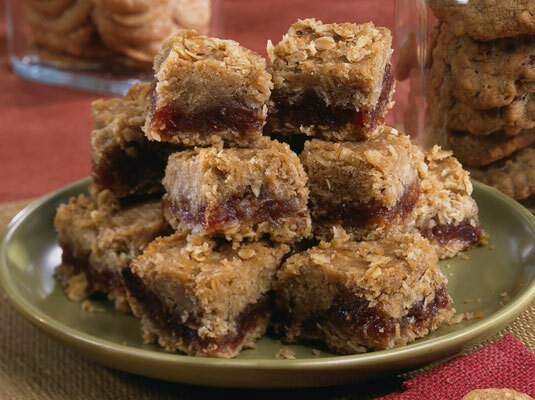 These baked date squares make a wholesome and satisfying dessert. The inside of the square is made up of sweet and chewy date filling, and the outside is soft and moist. In a medium saucepan, combine 2 1/4 cups dates, sugar, water, and lemon juice. Cook over medium heat until the dates are soft. Set aside and let cool for 20 minutes. In a mixing bowl, combine the flour, baking soda, brown sugar, and oats. Add the oil and mix until the ingredients are well blended. Press half the flour mixture into the bottom of the pan. Cover the flour layer with the date mixture. Sprinkle with the remaining flour mixture and press down lightly with your fingers. Bake for 30 minutes or until lightly browned. Cool for 15 minutes, and then cut into squares and remove from the pan.